Other photos: Photo 1, Photo 2, Photo 3, Photo 4, Photo 5, Photo 6, 70C, 70C, Photo 9, Photo 10, Photo 11, Photo 12, Cockpit, Photo 14, Photo 15, Photo 16, Photo 17, Photo 18, Photo 19, Photo 20, Photo 21, Photo 22, Photo 23, Photo 24, Photo 25, Photo 26, Photo 27, Photo 28, Photo 29, Photo 30, Photo 31, Photo 32, Photo 33, Photo 34, Photo 35, Photo 36, Photo 37, Photo 38, Photo 39, Photo 40, Photo 41, Photo 42, Photo 43, Photo 44, Photo 45, Photo 46, Photo 47, Photo 48, Layout. OUR TRADE - PLEASE CALL/EMAIL FOR SPECIAL PRICE AND SALES CONDITIONS ! The Hatteras 70 Convertible was built between 1998 and 2004. "Makaira" is one of the last 70C delivered, and his one of the few to have been built with CE Certification by the shipyard at origin (and not retro-fitted). A tournament proven winner, the Hatteras 70 Convertible, is designed for the yacht owner who demands luxury, the comforts of a magnificent cruising yacht and the features of a serious sportfisher when you need them. Smooth lines and curving intersections give her the popular seamless look others can only envy. 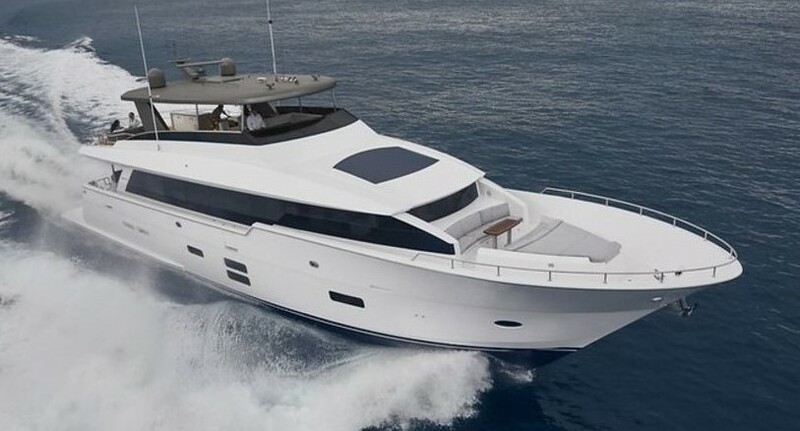 The super 70 boasts an 18' beam that provides for a luxurious four-stateroom, four-head standard interior arrangement. The full beam master stateroom offers a king-size berth, entertainment center, and fabulous private head. The bow stateroom is outfitted with a queen-size walk-around berth with pop-up access to under berth storage, while other guest staterooms provide upper/lower berths and converting twin-to-queen accommodations. The expansive salon with full galley features a comfortable lounging area complete with entertainment center and wet bar. The standard fluted wood valances with blinds and frameless windows add to the 70's interior elegance. The standard enclosed bridge provides all the necessities for fishing or cruising and may even be accessed via an optional interior stairwell. An additional aft control station is also located on the bridge for convenient fishing and dock-maneuverability. The large aft deck provides space for an optional chipped icemaker or molded fiberglass seating with cushions. A few steps below, the 159 square-foot cockpit is a sportfisherman's dream complete with twin storage boxes flush in-deck, refrigerator/freezer, molded-in transom fish box, seawater and freshwater wash downs and rod holders. It is easy to see why the Hatteras 70 Convertible continually proves itself to be among the ultimate world-class, long-range sportfishing yacht.